If you had asked me 2 months ago where I thought I would be right now, I would never in my wildest dreams have guessed. Sometimes a single event has a cascading effect that changes all the most carefully laid plans. But I've learned to trust that eventually things come into balance and that the world works in strange ways. 2 months ago, I had never even heard of this ride. 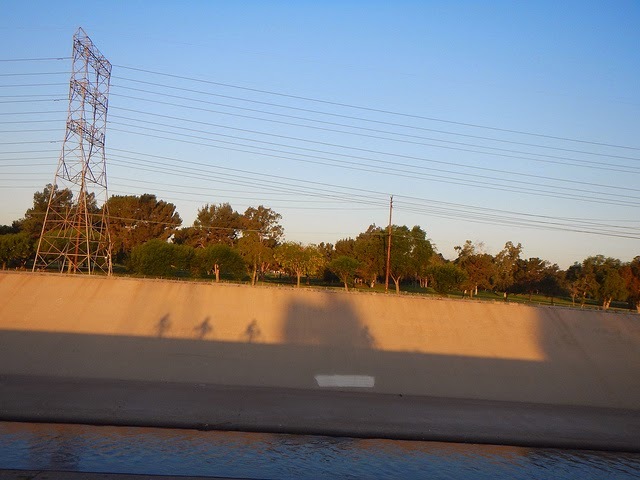 I was at my Dad's house in Phoenix having finished what turns out to have been a pivotal 300k. 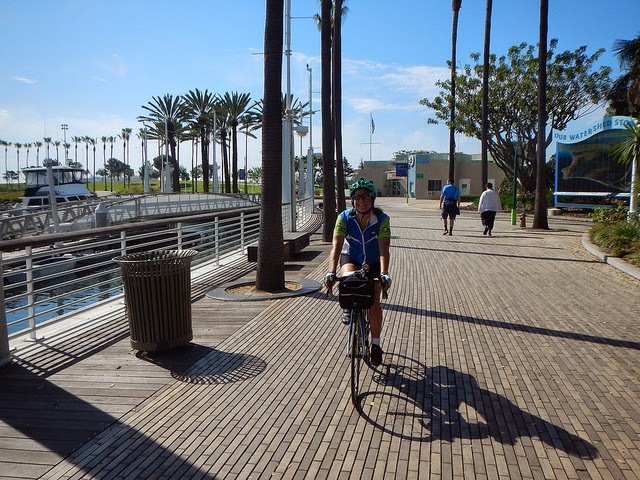 "There is a 600k in April with PCH Randos, almost 80% on bike paths. 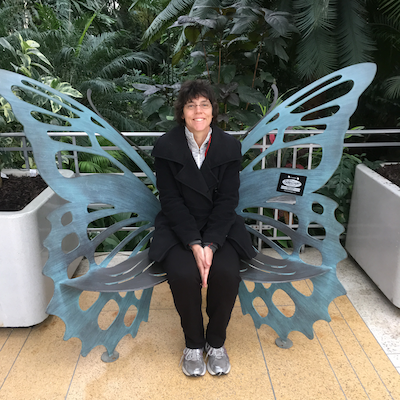 You would love this ride", Lisa told me. So I whipped out my phone, looked up dates and bought the plane ticket. Completely spontaneous, no regard for planning - and in the middle of Los Angeles. In the end, I would wind up going to part of Brevet Week in San Diego before this ride, but that wasn't originally the plan. But I had just had a most amazing 300k and it turned out that was only the beginning. 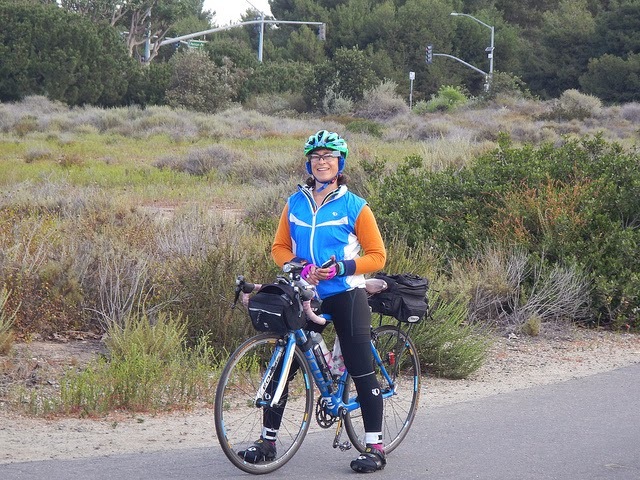 When I decided to do brevet week, I had shipped the bike and everything I thought I would need for this ride to Lisa's house in San Diego. So when it came time to prepare for the trip, the only thing I had to do was think about nutrition. I had bought a copy of The Feed Zone Portables and the three looped nature of the ride meant that I would have 2 stops to refill my own food. That is a pretty amazing luxury if you are trying to be more careful about what you eat. I spent several days experimenting with rice bars and settled on a few that would go with me to California. "A few" turned into about 15lbs in my carry on. 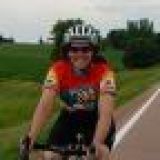 So I got to the start with Lisa, this ride would be the finale of our first Super Randonneur series. Also at the start were others I knew from previous rides: Greg, Stacy, and Charlie from the Gold Rush and the 3CR. Also present were 3 men doing the route on Elipti-gos. If you have never seen one, it looks like an eliptical machine on wheels. 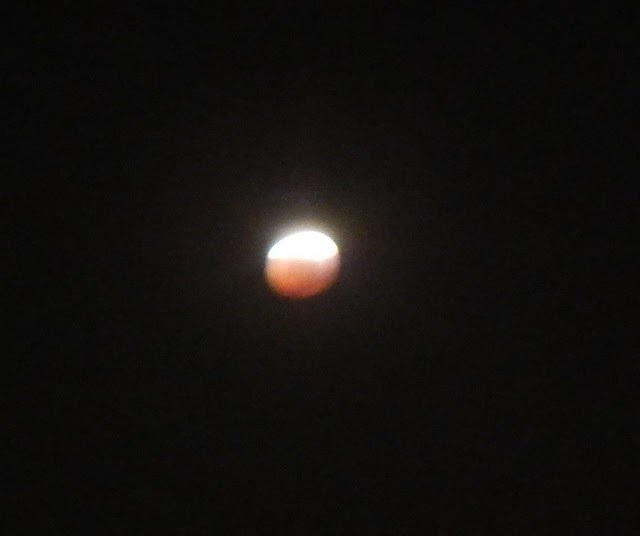 Oh, and floating very serenely above was the moon in the process of moving through a full lunar eclipse in perfectly clear sky. We rode out of the parking lot just at perihelion in a feat of timing that could only have been accomplished by an astronomer. A full moon on a 600k is a special treat, there is something mystical about them that always makes for extremes; they bring their own sense of time to the night. 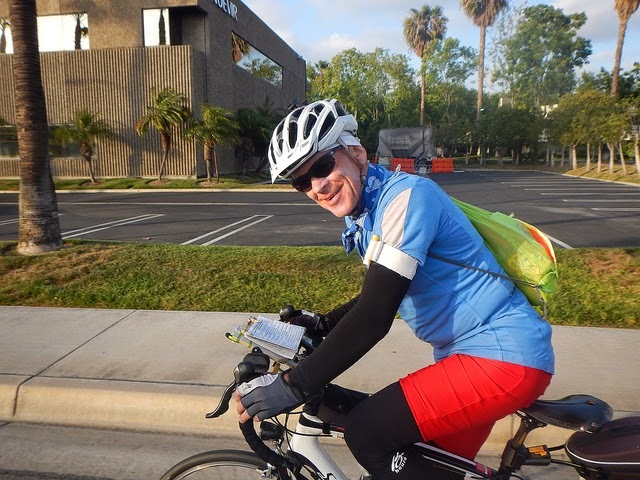 When I had told my Minnesota co workers I was doing a 375 mile ride in Los Angeles, the response was generally something like: Isn't that dangerous? Isn't there lots of traffic? Doesn't that google map show it going right through the setting for "Gang Wars 4: Urban Apocolypse"? Nope, I am here to tell you that Hollywood has it all wrong. LA is a great place to ride a bike. Which is really ironic because, after all, Hollywood is IN Los Angeles. So we all cruised down the Santa Ana River Trail towards the ocean with a veritable field of twinkling city lights surrounding us. It wasn't really very cold either, perhaps the high 40s so I was back to light knee warmers and the wind was cool, but invigorating. At the turn off the path was a secret control, more to make sure you got off the trail in the right place than to stop a shortcut. The next few miles were on sleeping streets with few to no cars in the dark. We stopped to try and help another rider with a crank issue but neither of us had an 8mm Allen wrench. Hopefully another rider behind us had one. It was just before dawn when we hit the ocean and the Pacific Coast Highway. The moon was beginning to settle into the sea at this point and I tried unsuccessfully to capture the moment when grey turns to blue and the moon yields the field to her more flamboyant sister. The PCH in the early morning is a great place to be on a bike. 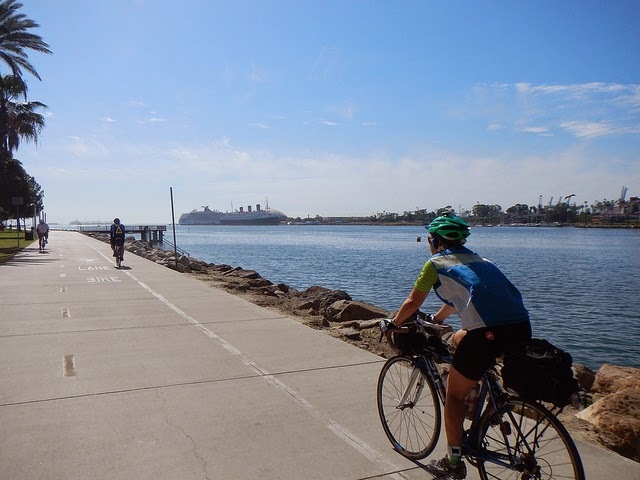 There was almost no wind and the full bike lane took us though quirky California communities and across estuaries and wetlands, birds hunting for fish and insects as the light increased. 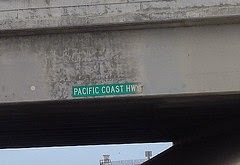 I really enjoy the PCH, it is a unique road that is unmistakable for any other. 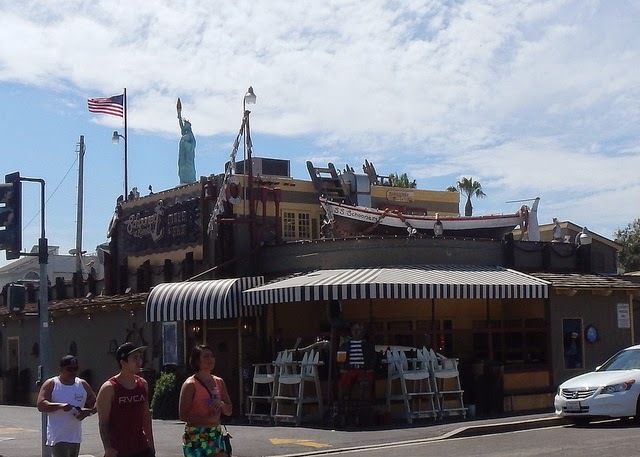 Hmm, Statue of Liberty plus pirate look - quirky ! At Seal Beach, we stopped at the first control needing only water. 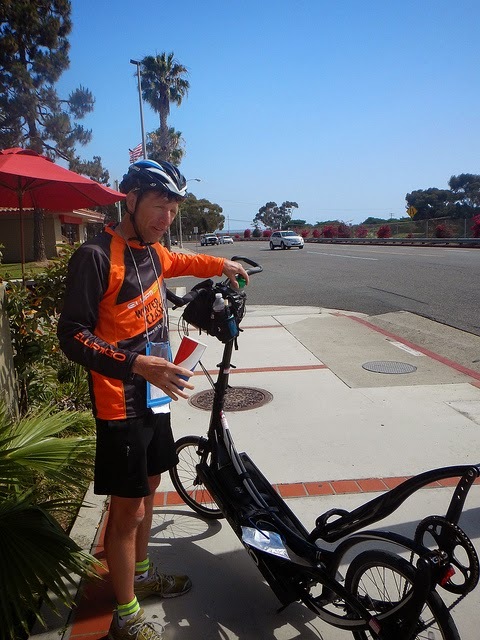 I stayed with the bikes and had a couple of my rice bars while Lisa ran inside for receipts and water. The rice bars were a real plus on this ride, I probably ate about 20 of them when all was said and done. 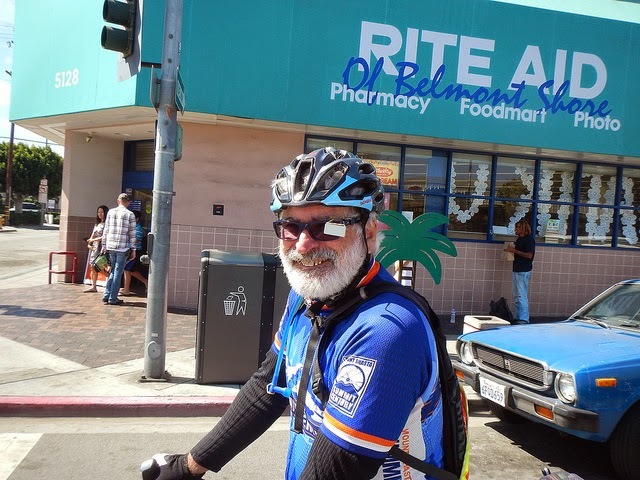 The elipti-go team showed up while we were there and we left slightly ahead of them with Charlie to turn onto the San Gabriel bike trail only a couple miles later. Despite now being in a more industrial area, the trail is a surprisingly natural setting. We saw water fowl, horses, chickens, flowers, and a tremendous number of other cyclists out to enjoy a perfect morning. The wind continued to be either friendly or non-existent. We met up for a while with Peter, a native of New Zealand. Lisa had ridden with him in previous years. He'd been trying to conquer the 600k for years and countless attempts. The 400k mark had always been somewhat of a demon for him. We would see him on and off all day. At the second control, we shed some layers and had some quick conversations with other riders at the control. This turned into an incredibly social ride; we saw people at nearly every control. Lisa and I again relied on the bars and food we had already brought, purchasing only water. By this time, the sun was in full control of the sky and the morning coolness was fading rapidly. 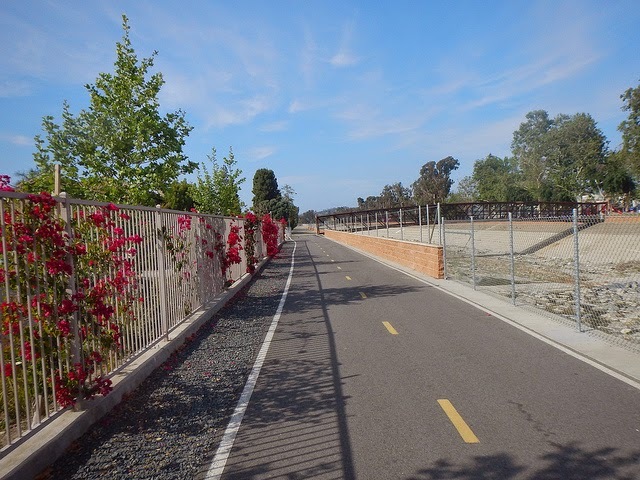 We returned to the San Gabriel trail to split off onto the Rio Hondo Bike Trail. Like the San Gabriel, this one was along the top of a river, though this one was much drier and had little to no vegetation. 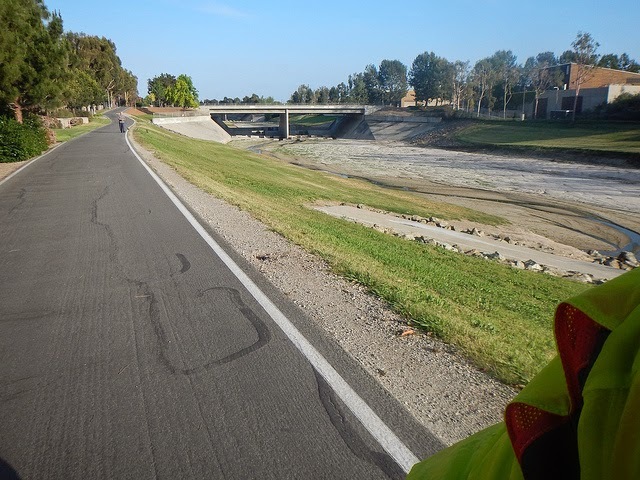 This section passed through the regions of Los Angeles that had so worried my co workers, the Compton neighborhood of East LA is a rough neighborhood, but from the trail, the only thing I saw any different was the the empty, paved river was a little dustier. At this point, we we were leap frogging with Charlie who was having issues with his GPS. I always say that the road to hell is easily routable by GPS. One must take them with a grain of salt. 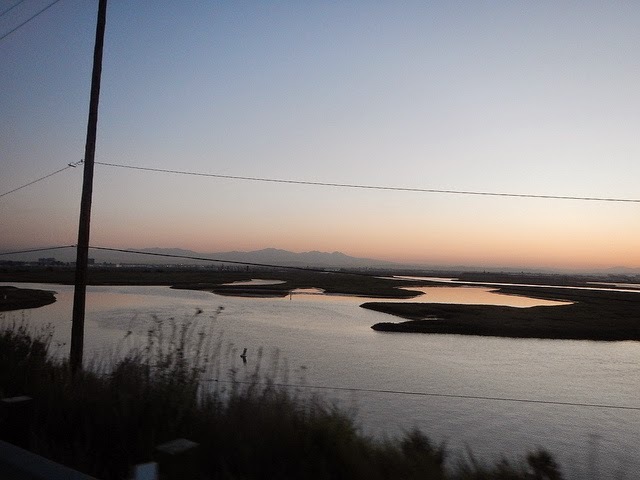 At the end of the Rio Hondo, we emerged into the circus of Long Beach. Arriving in Long Beach - Cruise Ship anyone? It turned out that despite the best efforts of the RBA, the Long Beach Grand Prix had spilled over into the weekend and the route was partially closed. We followed the festive route down the boardwalk and past a marine full of million dollar yachts. The carnival atmosphere was getting into full swing with small groups of people being to coagulate into what was surely to be a huge crowd in the afternoon. We wound up asking a policeman for directions and finally extracted ourselves into an old neighborhood that resembled something out of Chinatown. After a bit of a romp in the urban jungle, we made it to the control at a bit past 100k. It was hot at this point, the sun sucking into the pavement like butter melts into toast. Peter who was riding alone, but very strong. Many were out enjoying the beach and the surf was definitely up at Huntington Beach which had large crowds on both the road and on foot. A bit of a party atmosphere, very different from the isolated, rural rides back in the Midwest. California and the rains from the previous month had not made another appearance. At the Motel 6, we got our cards signed and visited the room for a 45 minute lunch stop. I amazed myself by eating an entire bag of roasted chicken along with some very tasty empanadas that Lisa had made with collard greens, pumpkin seeds, and spinach. I refilled my front bag with rice cakes and other food and we took off for the second 150 mile loop to Beaumont, the hilliest part of the route. Lisa and I left around one by ourselves with no idea when or where anyone else was. The second loop would take us north west up the SART about 20 miles to Corona. The first 75 miles gradually climbs to Beaumont and this section was a great time to chat and enjoy beautiful scenery and the big tailwind. We now faced the mountains and the valley was surprisingly green, though Lisa told me that many flowers were past their time. Inevitably, rando conversations turn to all manner of subjects. We talked about many of our previous adventures, particularly 600k-plus sized adventures. Ever feel like you have a long-lost sibling? We must have been chicks in the same egg batch in some previous life. Probably albatross chicks, it's the distance thing and the quirkiness. We finall exited the SART at Green River onto a road with the heftiest climb of the day so far. I've been trying to work on climbing (okay on a spin bike), so I tried to pace myself a little faster than I normally would. Unfortunately, just as I really thought I was making progress, I completely fell apart and stumbled up to the top panting like a chihuahua finishing a race with a husky. "You were really doing well until you fell apart, but it was 10% in one spot", was the humorous report on the effort. Besides it was really hot at this point. The next few miles to Corona really wore both of us out and I was overheated at the near 90 degrees my thermometer was reporting. We stopped at the Lucky Greek Burger spot to cool off. I sat in the shade to watch the bikes and cool off while Lisa went in for ice and water. They allowed you to refill as many times as you wished as long as it was from the same cup you bought. We filled bottles reusing the cup about 6 times. It turned out that she was as hot as I was, but just hadn't felt it as acutely. Charlie caught up to us just as we devolved into pouring ice down the jerseys which is a great randonneuse-only trick. From Corona we had a few miles on city streets and through neighborhoods as we made our way to the Hidden Valley Bike Trail. 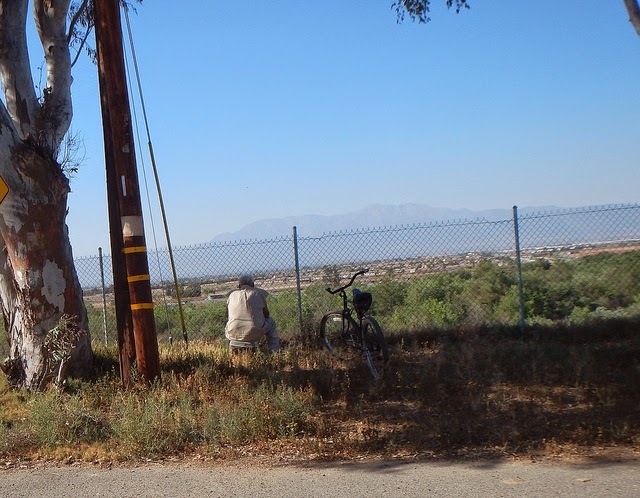 This part of the greater LA area is more mountainous with steep inclines and quick descents. The bike trail was a highlight of the ride, it sits far up the slope overlooking both the green river valley and the mountain ranges to the north. It seemed like every corner had some small scene that just screamed to be in my photo journal. We wound our way around the trail and Charlie dropped off at some point. 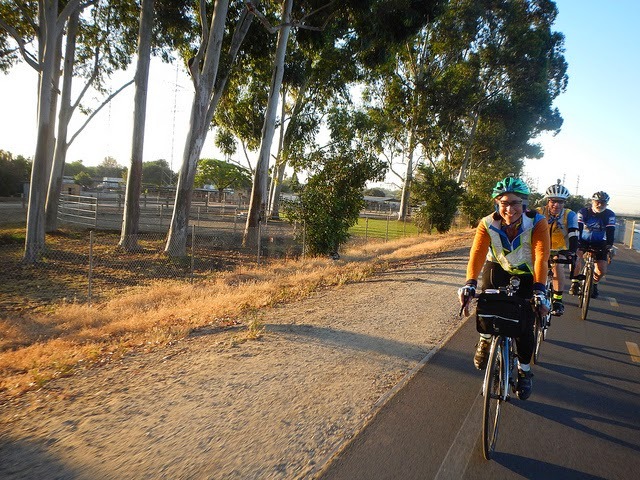 It was late afternoon when we came into Redlands and exited the bike trail. At the control were a host of people getting things done. At this point, we were both still quite hot and we had a couple of very delicious mango popsicles to cool down. The next section to Beaumont had the most climbing so we took a little time here to adjust things. I missed the trail as we got into rush hour traffic on Barton Road. The road steadily gained and lost elevation and at one point, I actually dropped my camera! Fortunately, it is shatter-proof. though that Walnut Street was the worst of the climbs and by the time we got to that turn, the sun was beginning to set. In the twilight, we pedaled up, both of us together. I was working fairly hard and I can't tell if Lisa was or not (probably not). But my climbing is improving. At the very top, the sun bade us farewell and reflective gear on, we cruised down the other side in a steep, but fun descent. The air cooled quite quickly and we had a couple of stops to adjust clothing before witnessing a spectacular moon rise over the hill now directly in front of us. Pictures came out terrible, but trust me, it was magical. One of those big, reddish rises. The remaining miles to Beaumont were still uphill and I was ready to be there. Both of us were a bit shambled after the heat and climbing and both were craving salt. My sinuses were running and Lisa's were downright painful, lots of dust and the very dry air hadn't done either of us much good. We finally made the final turn at the top of the climbing on Oak View and floated down the hill to the gas station and the same pack of riders including Nick, Peter and Jim. We stayed a little and I had some food to perk up. This was by far the coldest part of the ride and I was dismayed to find I had left my long fingered gloves behind. I wrapped a scarf around one hand, tucked the other behind my front bag and we headed down the hill. It's almost all downhill to the next control at Ruth's house. Which meant cold and for me meant sleepy time. My circadian rhythms kicked in full force and I dropped back to decide how to wake myself up. Since my dentist told me gum was forbidden (bad jaw issues), I was left with caffeine in a tablet or other tactics. I did several with Lisa a few hundred yards ahead wondering what the heck was going on. Finally, one effort worked and the temperatures began to go up as we got back to Redlands. With the sleepiness gone, we meandered through side streets to Ruth's house. She and her husband (whose name I just can't remember) had quite the spread, and I had some rice with extra salt. Another rider, John was also there trying to eat - he'd had a bad taco earlier and was still nursing a sour stomach. We didn't stay too long, the overnight was only a few miles away and Lisa had never had a sleep stop before. This was to be a first! So off we went back to the road. After a wrong turn in Riverside, we got back on course to find John behind us. The three of us stuck together until the control at Corona but first, we had to get down Victoria Road. At midnight, we couldn't see the beautiful old houses terribly well, but we could see the 150 stop signs on each block. Both Lisa and I are pretty dutiful about stopping too. So this road took a long time. We leap frogged with John for most of this section and were relieved to turn off onto any other road. At Corona, I dashed in for receipts and Lisa and I left quickly - it was still rather chilly and we really wanted to be done. There was some climbing back to Green River and we paused to make adjustments before getting on the trail. John blasted by on a mission onto the trail. About 3 minutes later, Lisa's light abruptly died. We fussed with it quite a bit and couldn't get it to turn back on. I pulled my spare off my front rack and stuck it on her handlebars. We only had about 20 miles to go. No problems. 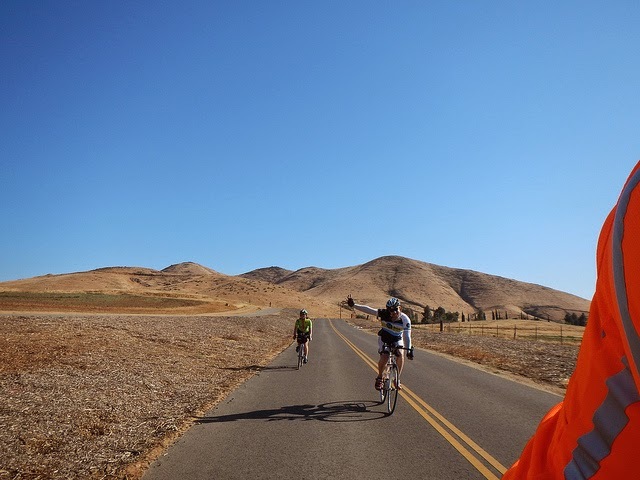 The last few miles on the SART were fun and we chatted up all sorts of weird subjects that probably only randonneuses could have thought of. We laughed a lot, what can I say? At a bit after 7, we piled back out onto the SART and made our way back to the PCH this time turning left to go southwest. There was a fairly still south wind blowing and we had originally worried that the 30 miles would be a grind. We were pleasantly surprised to find a cross wind instead of a headwind and the time passed quickly. 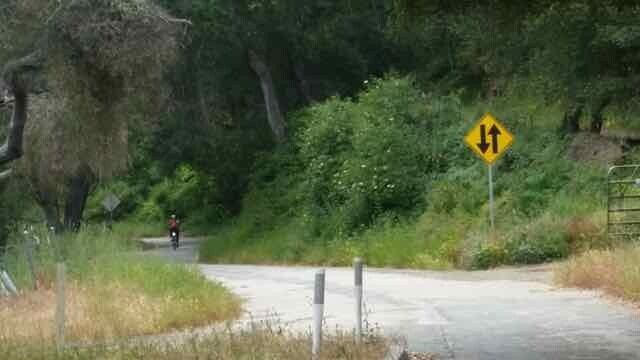 This was one section of PCH I had not yet ridden on a bike, though some parts were vaguely familiar (from time spent in my early teens). 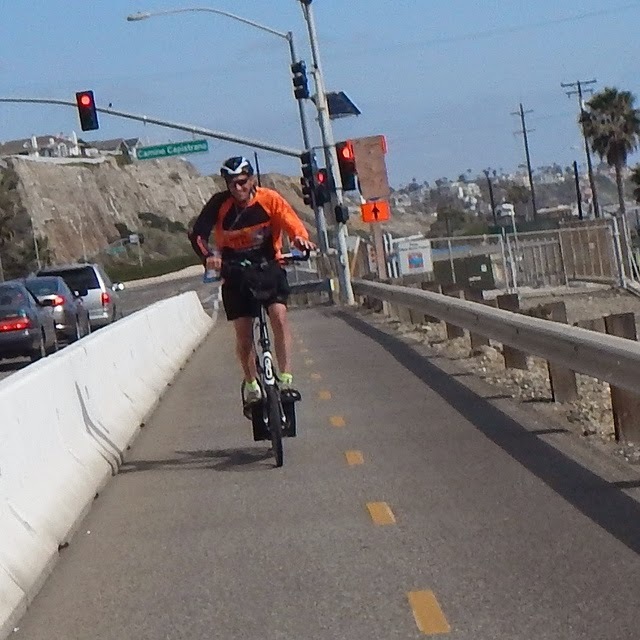 PCH has some epic rollers, not very steep, but quite long and enough to not really get up the other side entirely. Some of them also have inconvenient towns right on them. Like Laguna Beach, where I blew all my momentum by being stopped at a traffic light just at the bottom of the roller. 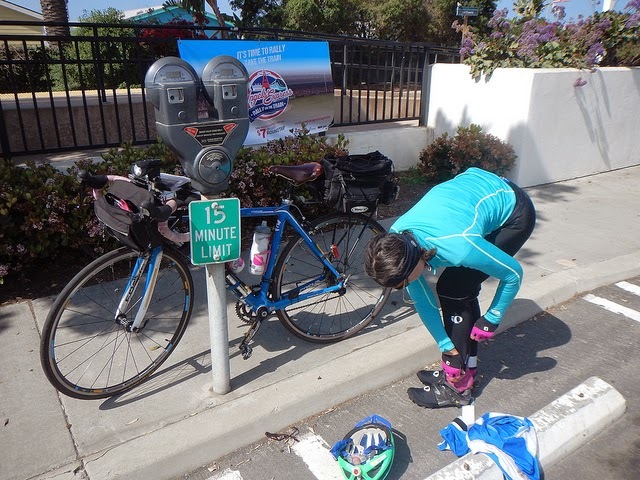 We were both really quite hungry by Dana Point at 32 miles and stopped at a grocery store for additional food. I grabbed a couple of avocados (personal favorites to both of us) and what I thought was some nice juice, but turned out to be sweetened with stevia (which tastes nasty). Oh well, go for the orange juice next time. We were on a time limit...15 minutes tops. After Dana Point was a nice detour onto a bike trail through a small park and back to the PCH. San Clemente was only about 7 miles down the road. By the time we got there it was getting hot and we pulled over to remove layers. 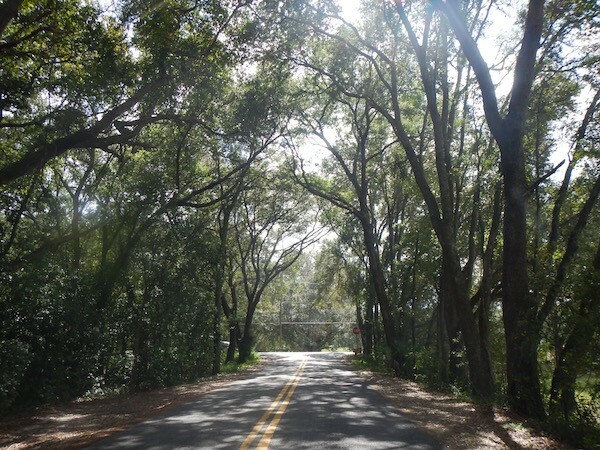 The route through San Clemente was different than the ones used by San Diego. We wound around tiny streets doing short, choppy hills. I liked all the small, well kept houses. Though the constant short climbs precluded pictures. 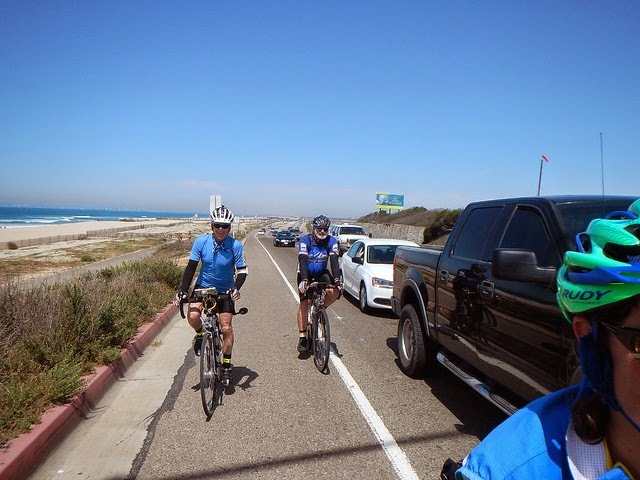 The last leg through Camp Pendleton was another fun time. I'd been there previously and recognizing the route gave me a sort of odd familiar feeling, though how you can feel familiar after riding something one time is beyond me. Several riders passed us going on the return, probably only about an hour ahead of us. We finally hit the turnaround a bit past noon and had some rice cakes. Of course, we had to stop at the Taco Shop on the way back. It was even a control!!! Rorschach Test: What do you see here? Going back through Pendleton was again fun, but now having done it three times, I have to point out some of the more interesting landmarks. 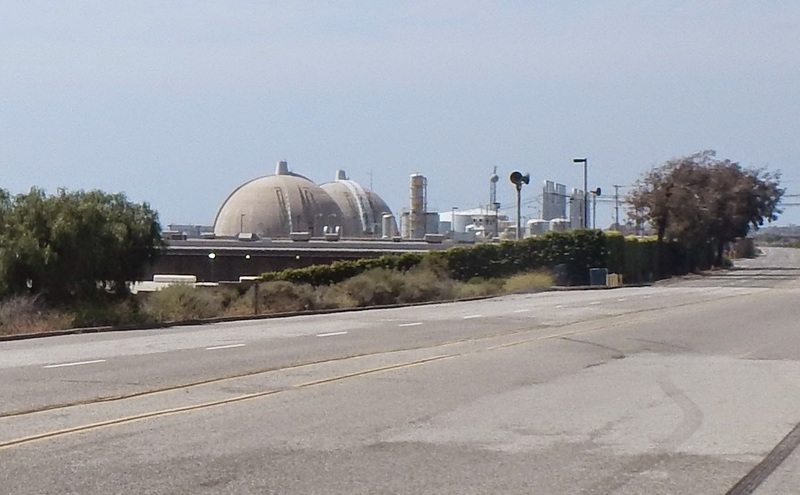 There is a defunct (and suggestive) nuclear power plant. Beats the heck out of our nuclear power plant here in Minnesota for looks. Seriously awesome rider, or is it elipti-goer? In any case, we made a quick beat to the Taco Shop to see several bikes parked at the Carl's Jr next door. Lisa had a taco and I bought a 20 oz tub of guacamole and some chips. Yes, 20 oz - I had to ask twice. We proceeded to eat about 3/4 of it and packed the rest for later. Substantially refreshed, we prepared just as Jim pulled up on his Elipti-Go. I walked up and asked how the ride was going and if I could take his picture. He had that zoned look that all of us get when we haven't eaten enough and told me he was on a 375 mile ride in 40 hours and had had 15 minutes of sleep. Hmmm, the PBP jersey I was wearing and the rando bike were not enough to penetrate the fog. He really perked up after a cold drink. Apparently, Elipti-gos are not super fast, though you could have fooled me, he kept up with us just fine for quite some time. 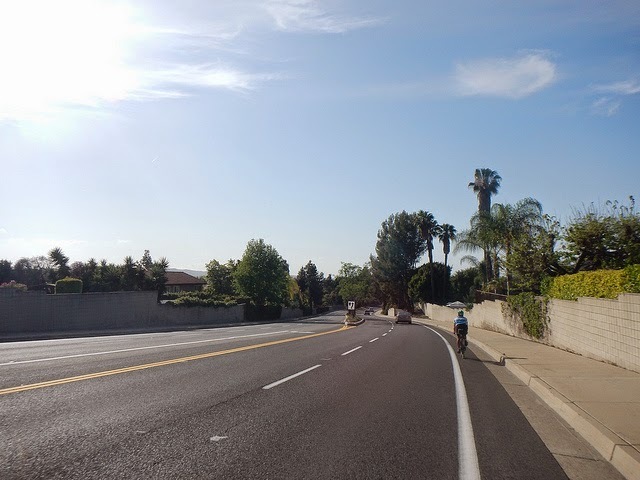 We continued on back to Dana Point and picked up yet another bike path to take us to the penultimate control in Lake Forest. This one again ran alongside a river (which was paved). But the flowers alongside were really pretty. By this time, I'd totally forgotten which bike path this was. Maybe I should have eaten all the guacamole after all? It went on for a number of miles and finally terminated in another neighborhood. At the corner, Charlie appeared out of nowhere. He'd been having an "argument" with his GPS and was finally back on track. We stuck together on and off for the rest of the ride. With so few miles left, it seemed so close, but this was one section that Lisa had not actually been on before, so it was also new to both of us. She had heard from a friend that there was a stinker hill just before Lake Forest, not something you really want to year at mile 340. At this point, we also caught up with Peter and Nick! 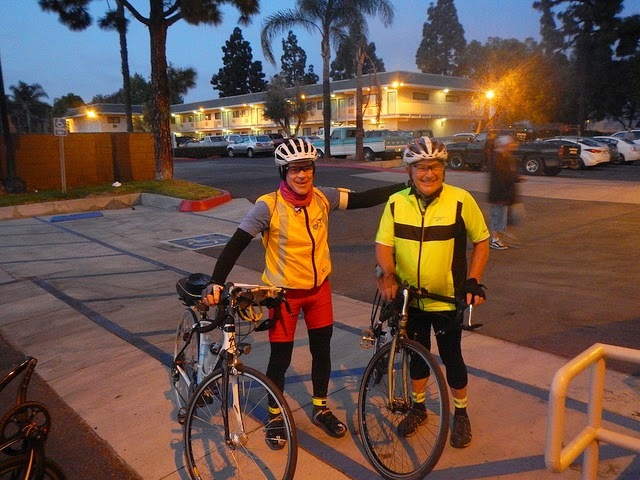 Both had met the previous day and Nick had offered to ride with Peter and get him through the mental wall of the 400k mark. They were finishing together. I did this last year for a friend back in Wisconsin. 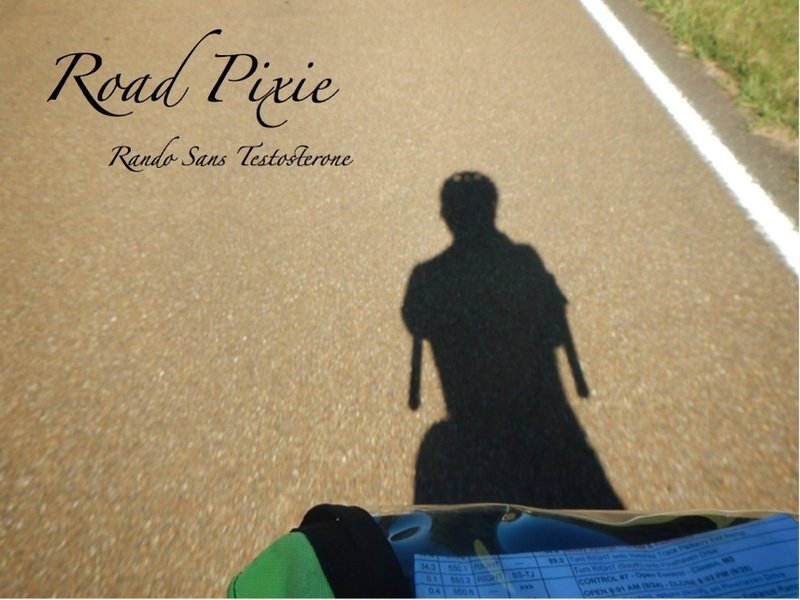 In my humble opinion, everyone should learn from such an act of true randonneuring. The point is for everyone to finish; we help each other get up the hill instead of beating each other up it. Peter had that glowing look that you really only see on people who are finally accomplishing a lifetime event - like climbing Mt Everest. 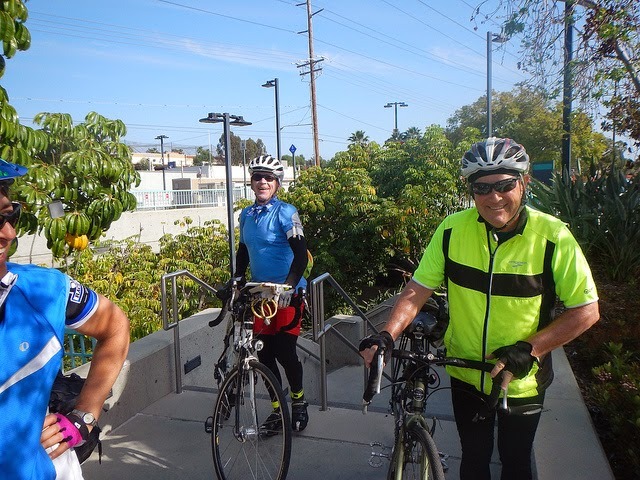 Peter and Nick, on top of the stairs - the hard part of ride is done. The four of us made our way to the Amtrak station where we had to carry the bikes down and up flights of stairs, cyclocross style. This beat the heck out of an extra 150' of climbing and was the official route. I did manage to do mine single handed - IronK is so proud, she could probably have carried one bike in each hand. After this, we had a winding few miles on a pleasant road until some traffic and the final big hill coming into Lake Forest. I have to say that by the time we got there I was filled with dread, but it really wasn't that bad. Lisa and I were still right on the same pace up it as well, though I still say she looks way more comfortable than I do (and pants less). From the top was a fun descent all the way to the control in a small shopping center. Everyone congregated at the corner and I got a final bottle of water and we finished off the empanadas (which were really tasty). The guys pulled out ahead of us and we were with Charlie for most of the last 20 miles to the finish. It was mostly downhill and the final bike path, the San Diego Creek Bike Trail was really nice if not just a touch confusing for those of us on a bike for 36+ hours. We finally exited the trail and had only about 15 miles left. Charlie wasn't feeling quite up to snuff and after a close call at a traffic light backed off for a snack. Lisa and I caught the rest of the guys and we were together for quite a bit of the last few miles. Peter had to pull over to change some clothes at one point and Nick waited for him so Lisa and I continued ahead. The two of us were on a sort of mini-mission to finish before dark. I think we just didn't want to stop again to put reflective gear on. We hit the SART for the final few miles and we had a screaming tailwind for the last 7 odd miles. Two other men came up behind us and I assumed they were on the back of us, but when we turned off the SART, they were gone. I guess we sort of left them in the dust. Maybe a girl thing? So we made our goal and pulled in at 7:16 for a time of 38:16 with a sleep stop. Lisa got the "Speedy Gonzolaz" label from Terry, the RBA on our arrival. About 15 minutes later came the two men of the hour whose pictures really should be framed somewhere. I hope they find this blog. Of course, this was also Lisa's fastest 600k ever and she also got the experience the thrill of the sleep stop even if she did have to deal with a pasty Minnesotan panting up and down hills and probably snoring at the overnight. Needless to say, in a year like this, we now have "plans". I didn't get to congratulate Charlie, who finished behind us while we were showering. John and Yogi (who I knew from 3CR) also finished just behind us as did Jim on his elipti-go. Only 4 DNFs which is very low, a tribute to a really great ride. I also didn't get a finish picture of myself and Lisa, but word has it one exists on Facebook somewhere and has lots of likes. The last rider came in with time to spare and Terry, Peter, Lisa and I all had enough energy to go and eat dinner (after showering of course). I hadn't planned on that a month earlier so my clothes had bike grease stains, but you can't have everything. Perhaps none of us was in the most clear minded state as we ordered various dishes with various things off or on. Peter ordered his dinner "without cheese" only to have the waiter return and say the kitchen had declared that it could not be done. He had ordered the cheesiest thing on the menu and there would be nothing left on the plate without it (he decided to go with the cheese after all). I half fell asleep as soon as I finished eating and we were really glad we only had to drive about half a mile back to the hotel. But to be able to have energy like that after a ride was the capping stone of a great time. My many thanks to Terry Hutt who put together a most extraordinary route in a city that should really get more press as a cycling mecca and who stayed awake and in his hotel room for hours signing cards. That's a ton of work. I will definitely be coming back in the future. And my thanks to the best riding partner I could have asked for. Who would have guessed it would have been so. An entire SR in 8 weeks going from an occasional email to someone I'd trust with my life.